This is my first time entering the Visual Dare Flash Fiction contest. 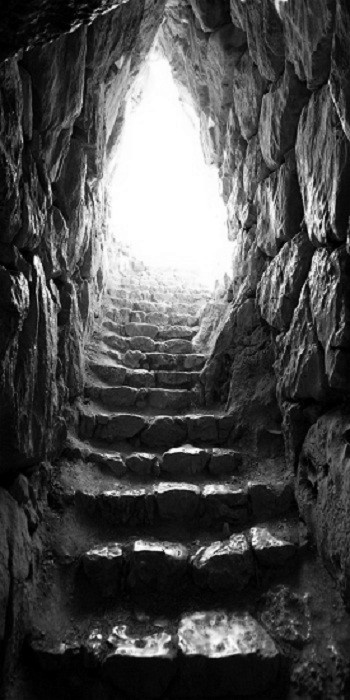 They huddled together at the bottom of the stairwell, waiting for the screams to stop. Although they hated the sound of them, the silence afterwards was much worse; it meant that another would be chosen soon. They had been down there so long they had become like family, and they clung to each other now, bound in their grief and horror, listening to the last death throws of another. Being deemed undesirable this was their lot, and all they had was the hope that it wouldn’t take all of them this time, and that maybe some of them would get a chance to live a few more days, even in this place of empty hardship. Some even dreamed that it would end completely and the alliance with the new world creatures would be broken; their sacrifice no longer necessary. But in a place such as this, there were only dreams. Everyone stopped and turned, as they had been trained to do. They didn’t look at each other, they just all moved as one towards the ringing. There was no panic, no rush; they knew there was time; they knew they would all fit easily into the shelter as previous drills had revealed. They lined up neatly inside, not a sound between them as all eyes turned to the ceiling, waiting. This time it was for real, this time it wasn’t an exercise, and their eyes widened as they heard the crashing sounds start above. Alice had been sifting through the contents of the old box in search of something else, when she stumbled across them. She couldn’t resist opening them and having a read, reminiscing over her lost love. The letters had been nothing less than an out-pouring of his soul, and she found herself sick again with the love they had once shared; tears rolling down her face as they had when she had first opened them. She heard her husband call up to her; wondering where she was and whether she had found their old wedding photos. She didn’t reply as she bundled the letters up and stuffed them into another box, trying hard not to think about the day she’d received the news that he wouldn’t be back; instead rummaging through the other boxes and pulling out the album from the special day she had spent with the man downstairs, shutting the memories of the love of her life away to be forgotten again. This weeks prompt is the word 'Inspire' - this is where it took me. “Inspire me!” She whispered in my ear, which made me stop and pull myself up on my arms so I could look her in the face. “What?” I asked; confused by such a request, which wasn’t along the lines of the usual dirty talk I was used to getting this far into a gig. I've been tagged by Lisa Shambrook in the 7-7-7 meme. Here’s the idea: Go to either page 7 or 77 of your current manuscript (or work in progress). Count down 7 lines, then copy the next 7 lines and post them up. After that, name 7 more authors to come out and play. My current manuscript is 'Sleep' (working title) and this is the extract from Page 7 of it. Enjoy and feel free to comment. It had worked, they were in synch. So it had only been a matter of time until the next step. It had been a long time since she had recalled any of the soft, gentler feelings she’d had towards him. She hadn’t dared; it hurt too much. And she’d been too consumed with rage. Now the rage was gone - she had quelled it. Lizzy felt the van start to slow down, and saw the steps of the court house ahead through the windscreen. And 7 authors to tag? (Some writers are posting it to Facebook, so feel free to post there if you like). On seeing this second picture on the Pinterst Board the eyes spoke to me and I had to write about him. I hope you enjoy my second entry. He blinked but you couldn’t miss those eyes, not even in the half light of the woodland; they flashed and sparkled, marking him out. He danced quickly away, but I wasn’t going to lose track of him. My eyes were locked on his figure, which flickered in and out amongst the shadows of the trees and the others who pranced around with him. The display was heart felt; they all wanted to be taken home that night, bearing their all – or at least their half naked bodies. The dance was full of hope edged with desperation, with a few dancing as close as they were permitted, to attract the attention of the best owners. But he teased, which made me smile, and he acknowledged my gaze upon him. He drew nearer each time he cycled daring to meet my eyes - a risky endeavour at this stage and one that could get him pulled out. But I didn’t mind, I wanted those eyes on me, I yearned to see the face free of the smudged mask, I wanted him to be mine. As the music escalated and the dancing became more frenzied, I held my breath, making sure I would be in time with my vote, not wanting to risk losing him and never seeing those eyes again. The drums rolled and the dancers froze and the master took his place. The moment the gravel came down on the block hands went up in the air showing the numbers they wanted. I daren't look at any others, only looking at the master’s eyes, waiting for him to acknowledge me and give me my vote. It felt like time slowed down as I waited for his movement to show in my direction. I saw him nod at others his head slowly turning, and then finally it came, a fraction of a nod, and I almost collapsed with relief breathing freely at last. I queued with the others eager to sign, eager to become an owner. When he saw me his eyes flashed in surprised and he resisted a smile. I didn’t and beamed at him, taking little notice of the pad I had to scrawl on to claim him. He followed behind me as I led him away to my home, careful to follow protocol; no talking, no touching. But as soon as the door was shut behind us I spun round and clasped his face in my hands, staring into those eyes that I had missed for so many years. His hands covered mine with as much speed, his lips seeking my fingers to kiss tenderly, as he returned the gaze of longing. 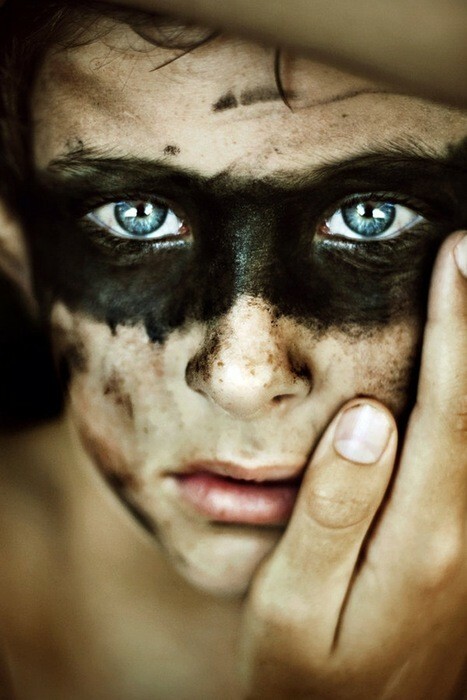 And a single teardrop drew a line through the black painted mask. The wonderful Meg McNulty has come up with a wonderful idea for a Flash Fiction Contest over on her site From Darcy to Dionysus, and I could not resist when I found this first picture on the Pinterst Board dedicated to it. (There was another, that will be coming soon). Elizabeth hadn’t expected to be invited, so when the postman rang the doorbell her stomach lept at the sight of the envelope; the gold filigree giving away the contents. But when he produced a parcel from another sender, she was a little puzzled. 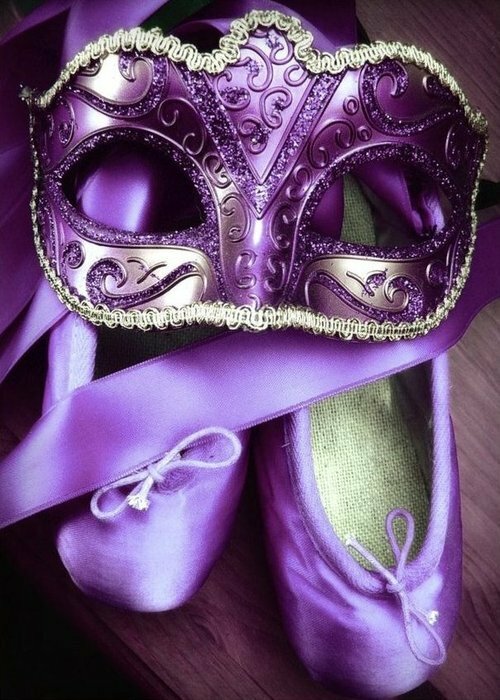 She found the contents enchanting; the mask and ballet shoes in her favourite colour, which matched her dress perfectly. But there was no note with it, or return address, so who had sent them to her? The shoes were a perfect fit as she twirled around the lounge trying them out, remembering the steps she had learnt at the academy. Then a question came into her head and she stopped mid step, how did they know her size as well as the colour? Everyone at the academy knew purple was her favourite colour, there was no mystery there, but her shoe size was different; she could only think of a handful of people that might. These thoughts slowed Elizabeth’s preparations, but not her excitement as she donned her petite tulle-bottomed dress that evening. The ballet shoes set it off perfectly, and she left her hair down to help the mask obscure her face. As the taxi pulled away, leaving her at the steps to the great hall, butterflies took flight in her stomach. But she donned the mask, taking courage from its anonymity and joined the others making their way inside. Feelings of apprehension were soon forgotten when Elizabeth found everyone inside was as concealed as she was. A sense of freedom took over as she agreed to dance upon dance with men she could only guess the identity of, due to speaking while dancing being strictly forbidden. Elizabeth could only study the eyes and mouth of her masked dance partner; the hard black lines of intricate inlaid spirals obscuring most of his face and giving nothing away. At the end of the dance he let her go without a word, moving away to engage with other guests. She stood bereft, still not recognising his manner, although there his carriage and stance were familiar. Who was he? The next couple of dances she may as well have been floating for all the presence she gave her suitor; her mind gone, searching for a further clue to the identity of the man behind the black mask. And that was it; she knew and laughed out loud, letting him swing her round faster. And then, at the end, he swept her into his arms and she met his lips for a kiss. I was tagged to participate in the Next Big Thing by two wonderful writer friends: Mark Etheridge (My Soul's Tears) & Laura Jamez (Office Mango) And although I had already done this in another form some time ago ( 'Inspired Blog Hop' ) I decided to repeat it, as I am now working on a different novel. Sleep – this is a working title, although I do like it. Back in 1991, I wrote a short 800 word piece for a competition to win a James Herbert book (Portent). I didn’t get anywhere with the competition but I liked the piece and always wanted to ‘grow’ it into a novel, but knew I wasn’t up to the task then. Now I think I am. Psychological thriller – although not a murder mystery – the murder is no mystery at all! Although my books run as movies in my head as I write them, I never see present day actors as them or even think of casting them, so I find it very hard to do. Sandra Bullock comes to mind, as she could pull off the lead quite well – physically and in terms of acting ability. For pure acting ability, Charlize Theron, or Hilary Swank. What is a one-sentence synopsis of the book? Lizzy Dyson is a woman pushed to the edged and passed, by her husband, who she murders along with his lover in their marital bed, and the ensuing trail discloses what pushed her. I hope to go the traditional route – by an agent or even direct to publisher where possible. Still in progress – only started in November 2012 so not far in yet. Books would be hard, but the film ‘Falling Down’ with Michael Douglas is how I see it, or a reverse of this, where the audience sympathises with the main character at the end. A competition, coupled with a struggling relationship I was in at the time, which would make me very angry. The short piece I wrote captured an essence of an idea and one I hope to do justice to. In terms of overall inspiration to write a book – especially a book that will hopefully capture the reader and draw them in – I have to turn to the authors that draw me in – such as Stephen King, Clive Barker and James Herbert. They are who I cut my teeth on so to speak. As each person is brought into the court room as either character witness or to give evidence, Lizzy remembers what part they played and the events that led to her own mental demise. As I was tagged twice for this, and every one I can think of who might participate has already been tagged, I'm going to skip it this time round.